Checking the bees in July. I was a little worried. One of the hives I manage had a bad die off from some pesticides a neighbor applied early in the year, and they have had a hard time coming back. I’ve spoken with the perpetrator, and they have seen the light (vinegar kills plants too!). The hive in Duvall has been a struggle. I may not run it again there next year (more on that later). 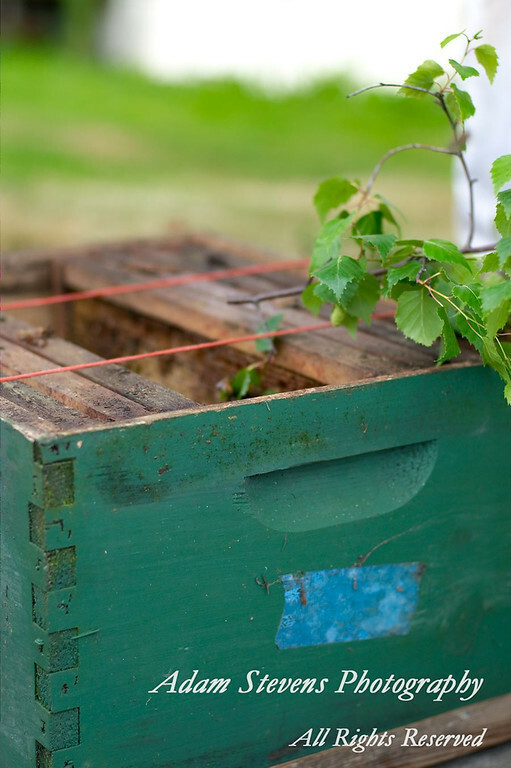 The hive at the farm though is doing well. In fact, given that I pulled a split out of them in April, they are doing really well. There is still some bloom to go, and they have a super and change full, as well as both the brood chambers jammed with honey and a good supply of pollen. But don’t take my word for it, check it out! 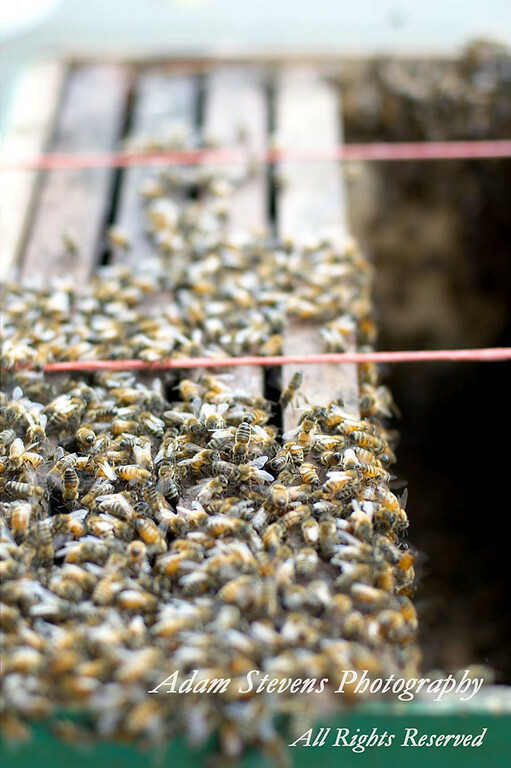 This entry was posted in Bees, Farmer Adam and tagged Beekeeping, local honey, Organic, Small Farming, Stanwood on July 21, 2013 by adalynfarm. Seems like about this time every year, I’ve gotten to catch a swarm. 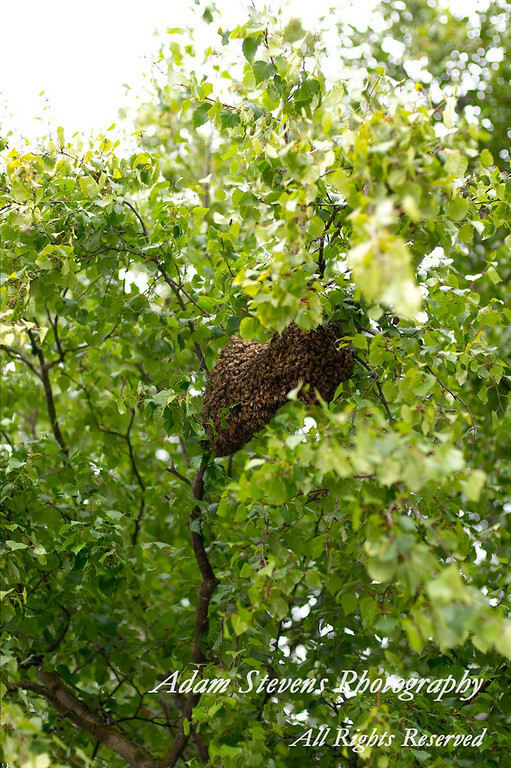 This year it was from a hive I am ‘maintaining’ at a friends house about three miles away. I say ‘maintaining’ because in theory, if they swarmed, I wasn’t doing my job very well. But hey, they are Italian… A dinner guest of theirs was able to shoot a video of me hiving the swarm. Enjoy!! Also, for the curious, I have been taking photos, and gardening, fairing, planing, mowing, milking and such at a rabid pace. As things slow down after all the food is put up for the fall, I’ll get back to sharing ‘what I did on my summer vacation’. 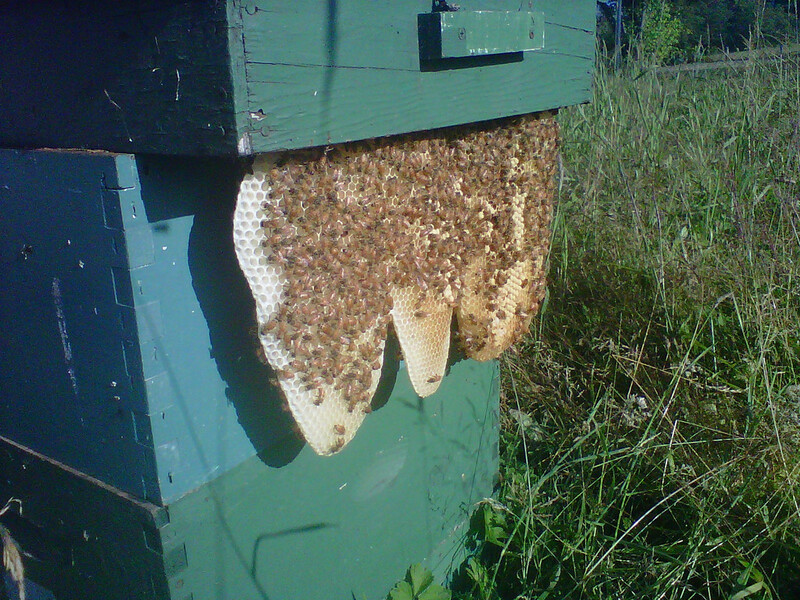 This entry was posted in Farmer Adam and tagged Beekeeping, Bees, Small Farm, Swarm catching on August 10, 2012 by adalynfarm. So the wonderful farmer J said “fine, just don’t fall off the ladder” with the same intonations as she might tell our eldest that she could go play in the rain, but wold be doing her own laundry.. Awesome! 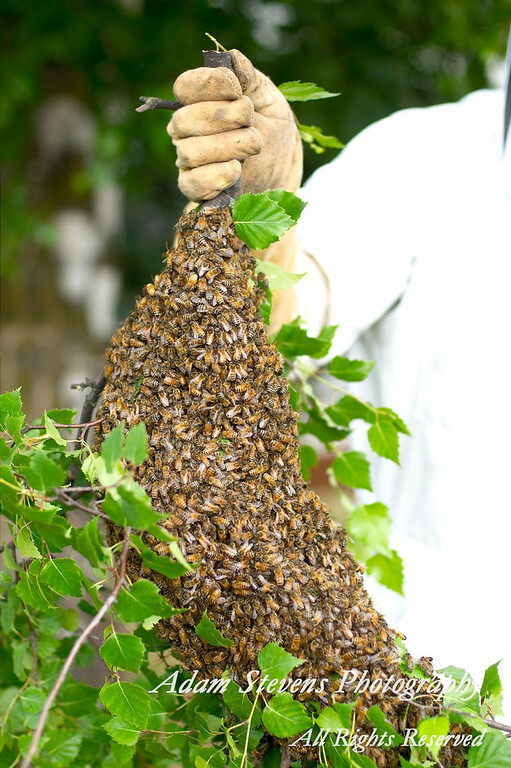 The swarm was about 14′ off the ground over a sidewalk, and I could ‘just’ reach the branch with the loppers. I managed to get them down, and shaken into an empty hive body. A few bees ended up back on the stub of a branch and after things had mellowed out, I clipped that off and tossed it in the hive as well. top screen and entrance screen and home I went! That’s about four pounds of bees! 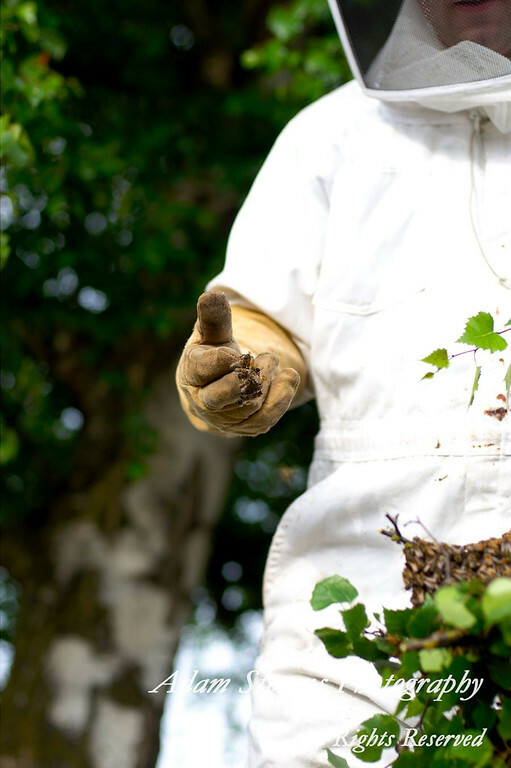 This entry was posted in Bees, Farmer Adam and tagged Beekeeping, Camano Island, farm photographer, Honey Bees, Small Farming, small scale farming, Stanwood, Swarm catching on July 12, 2011 by adalynfarm. I have been rendering wax in the house and I think I can possibly re-coat the old placticell with new wax and they will be more ‘useable’. Till then, they are getting drawn comb… My hopes are still high, Chesnut, Locust, blackberry and fire-weed. And I’m keeping my eyes open for knot-weed… For now, they are happy with my feed, and pollen from the dandy lions and the sun…. 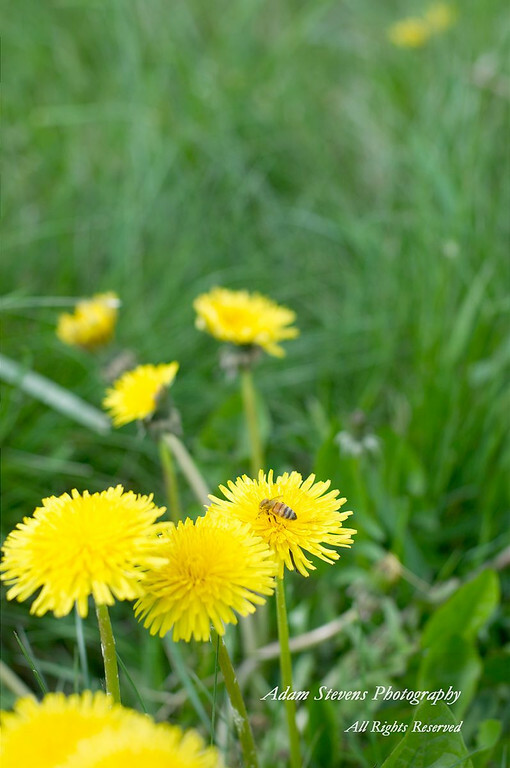 This entry was posted in Bees, Farmer Adam and tagged Beekeeping, farm photographer, Farming, Native plants, Stanwood on May 17, 2011 by adalynfarm.